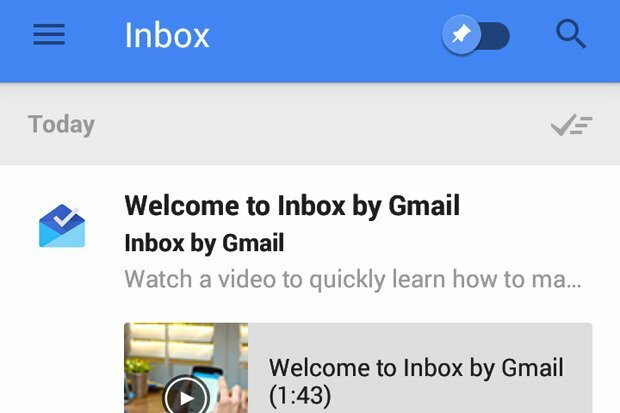 What is Inbox and how do I use it with my Android? 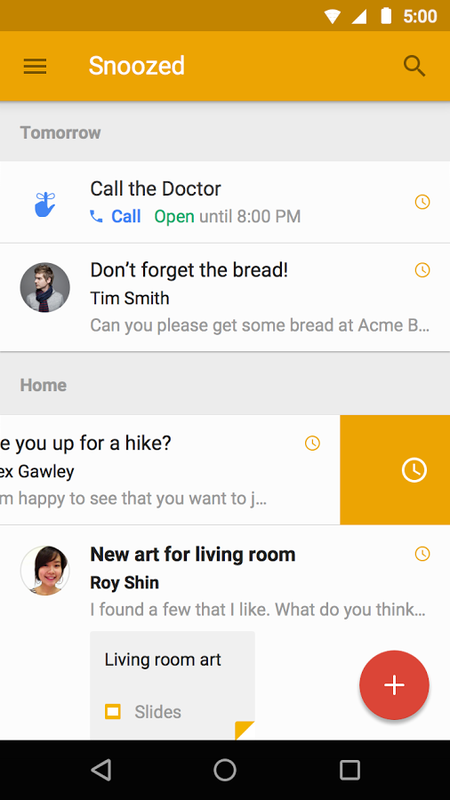 A few months ago, Google (through Gmail) released Inbox, a new email app to make using your email a breeze. But, what exactly does it do and how can you use it for your Android phone? I hope I can answer that! Inbox is an email app that helps get you to “inbox zero” (where there are no more emails in your inbox). It also simplifies your email in a lot of ways, like bringing attachments out to see in your inbox, and sorting emails by category. Let’s walk through each of the features. Bundles is the sorting into categories I mentioned. 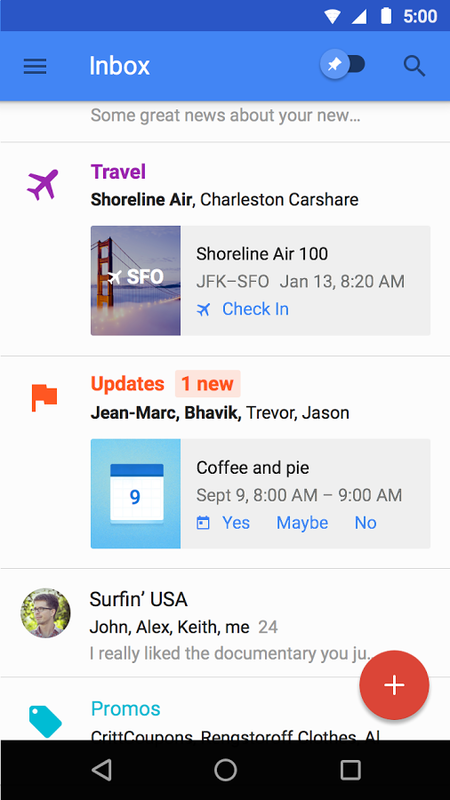 With Inbox, you have seven categories, or labels: Travel, Purchases, Finance, Social, Updates, Forums, and Promos. They’re pretty self-explanatory: emails related to travel go in Travel, emails related to purchases you’ve made go in Purchases, and so on. Tapping on one of the categories takes you to all the emails in said category. Any emails that don’t specifically relate to one of the categories (usually personal emails) will be separate and just exist within the inbox (gee, that can get confusing). This is the feature that brings important information or attachments to your inbox. For example, in the picture above we see pictures from the email “Weekend at Yosemite” without having to open the email. This also does this for things like appointments and reservations. In the picture above the “Bundles” section, you can see a reminder for a flight to SFO airport, and a link provided to let you check-in into your flight. Inbox does this for a variety of things. In fact, I’m sure I have yet to see them all! How do I use Inbox? Now that we understand some of what Inbox actually is, how do you use it to help you be productive and get to that illustrious “inbox zero”? Probably the feature you’ll use the most to go through emails are the swipe actions. These are actions you can take on your email simply by swiping them one direction or the other. Swipe from left-to-right, and you mark the email “done” (or archive it). Swipe from right-to-left, and you can snooze an email. This will be new to many users, but essentially this is one of the biggest ways to get to “inbox zero” without having to actually deal with every email. When you snooze an email, you basically make it disappear from your inbox for a set amount of time. So say, for example, you get an email letting you know about a concert you’d like to attend in a few months, but you need to wait for your next paycheck. You can snooze that email until payday, and it will pop back up in Inbox as though it were a brand new email (but letting you know that you snoozed it). Another quick and easy way to clear your inbox of unneeded emails is to mark multiple emails as “done”. You can do this in two ways: by hitting the check mark with lines behind it that is to the right in the grey header above a selection of emails. However, that marks all the emails below it until the next grey header as done. To mark multiple emails done by choice, simply tap the circle to the left that displays a picture of the sender (or sometimes just the first letter of the sender). Then once you’ve selected the emails you want done, hit the check mark now displayed at the top of the screen. Inbox also helps with a few other things. 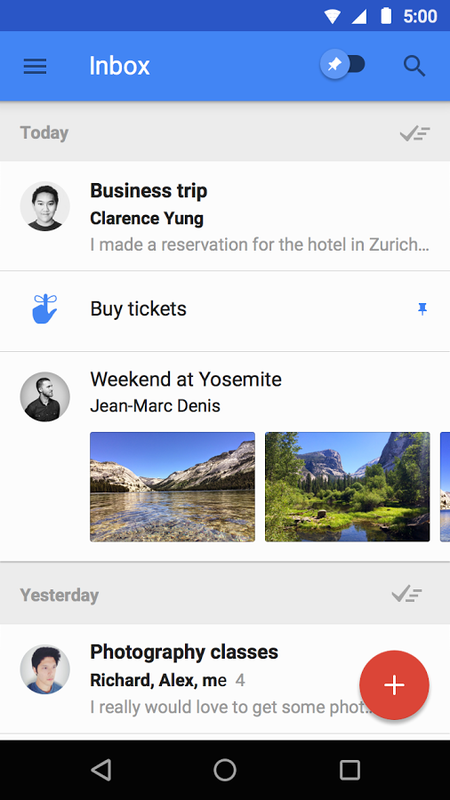 You can set reminders within the app, and they exist within Google Now as well. However, Inbox allows you to interact with them in more detail, and gives you more flexibility in snoozing them. Another neat thing Inbox does is allows you to search across all of your emails, including ones marked “done”. This existed in the Gmail app, but most people probably deleted emails instead of archived them, which takes the email out of the Gmail-wide search. With Inbox bringing the focus to just archiving, it gets the emails out-of-the-way, but still allows you to access it later should you need a piece of information from it. The biggest problem with Inbox by Gmail is it is not currently “public” so to speak. You need an invite in order to use it, but these days you’re very likely to get an email within a couple of days if you try. If not, Google has been holding free invite events on a semi-regular basis where you are very likely to get one. Either way, if you want to try Inbox by Gmail for yourself and achieve “inbox zero”, go to the Inbox website for information on how to do that. Then, download the app with the widget below. If you have any other questions, feel free to drop a comment below and we’ll help you any way we can!